I have been infatuated with Chicagohenge since learning about it not long after I moved here and I made it a point to schedule it in my calendar this spring so I wouldn’t forget. What is Chicagohenge, you ask? 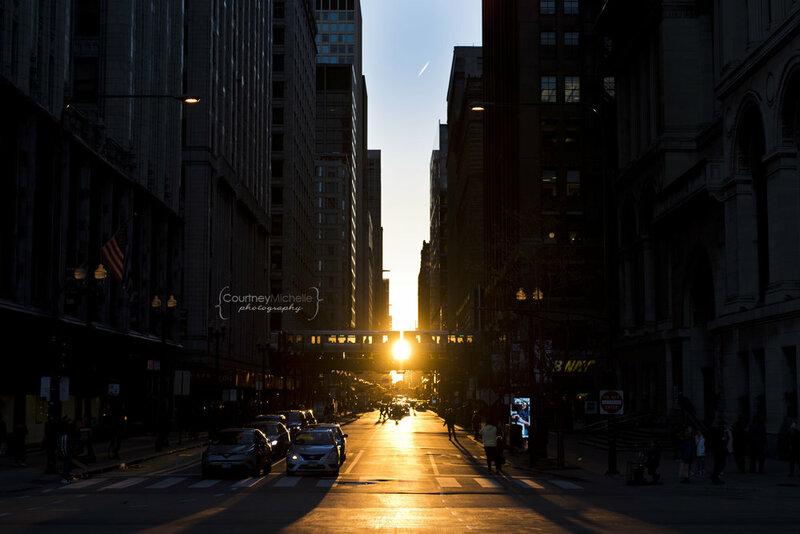 During the fall and spring equinoxes, the rising & setting sun lines up perfectly with Chicago’s street grid and creates a beautiful phenomenon that is coined Chicagohenge. The sun and it’s beautiful direct light dance in the street between the high-rises, traffic and pedestrians. Look down any East-West street in part of the Loop and see the sun framed perfectly between the buildings. It’s gorgeous! If you’re ever in Chicago on either the spring or fall equinox, make sure you’re in the Loop for this spectacular wonder! Get there early to grab a spot; its popularity is catching on and the streets are filled with cameras! This year I went down there two nights in a row, both evenings after the actual equinox, because it was cloudy and gloomy on the actual night of the equinox. I first went to Randolph & LaSalle, near the Cadillac Palace Theatre and the view was similar to the last time I shot there. The second night I went to Millenium Park (Michigan Ave & Washington) to challenge myself and try a different angle and location. I ended up loving the shots from MP the most, which I was extremely surprised by. Always a good reminder to get out of your comfort zone! Check out some of my favorite photos from the second night with the “L”, the pedestrians and the gorgeous ball of glowing fire in the distance. Chicago, you never cease to amaze me.